Verizon announced that an updated commercial messaging platform will be launched within a month to improve the protection of users. “This new platform will improve spam protections while continuing to enable commercial providers of SMS text messages capacity at scale,” the carrier said in a statement. The platform refers to Verizon’s “application to person” (A2P) messaging service that businesses can use to engage directly with consumers, e.g. for promotion, customer service, or consumer survey. Verizon did not disclose more details on how the improved security features will work other than that the “new platform uses a full 10-digit telephone number to help you recognize who is texting you”. However we can expect that this would be the first implementation of the RCS based messaging service that Verizon announced at the end of last year. So far, Verizon has been using its own proprietary A2P messaging technology. Despite that OTT messaging services like WhtasApp and WeChat are gaining popularity whereas mobile operators are losing values through SMS, largely due to the rich features these OTT services can offer. However, the more features are integrated in these services the more they are open to abuse, e.g. spams and phishing attacks, which drives consumers to place more trust in SMS and RCS (coming in messaging format). RCS is a “clean channel”, not tarnished by the privacy scandals committed by Facebook and co, or the over monetisation by others, said the software company Mavenir at the recent Mobile World Congress. Research shared by Mavenir showed 97% of SMS / RCS are opened within 3 minutes. 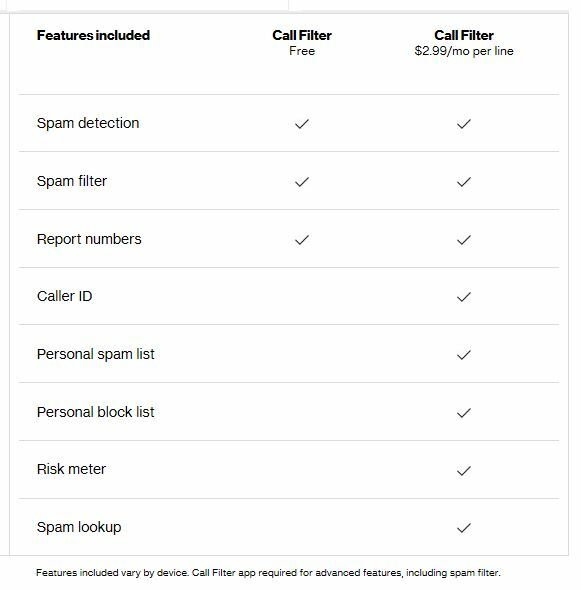 Verizon’s new announcement on the improved security for messaging came shortly after the carrier made some features of its Call Filter app free to its postpaid users at the end of March. Used to cost $2.99 per month, now users can have Spam Detection, Spam Filter, and Report Numbers for free, while additional features will still come at a price. Verizon is playing catch-up to T-Mobile and others that have already provided free spam protection. It can also be read as responding to a call from Ajit Pai, the FCC Chairman, late year that demanded operators to “adopt a robust call authentication system to combat illegal caller ID spoofing and launch that system no later than next year ”.